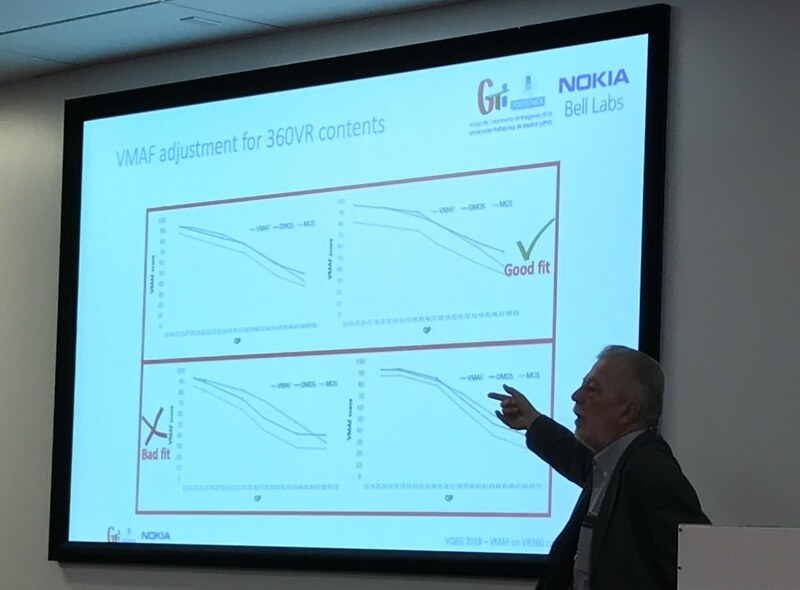 At the 2018 autumn VQEG meeting in Mountain View (California, United States), hosted Google, Narciso García presented the preliminary results of the novel application of the well-known Video Multimethod Assessment Fusion (VMAF) metric on 360VR contents, outcome of a project with Nokia Bell Labs. Since its inception, the full-reference VMAF has provided significantly good results on different types of non-immersive contents and viewing conditions. However, VMAF has been only applied to conventional (i.e. planar or 2D) video sources. So, our research team resolved to analyze the application of VMAF to omnidirectional video content without making any specific adjustments. The research was based on the underlying hypothesis of a monotonic relationship between 2D-VMAF (existing) and 360VR-VMAF (non-existing). Should it be true, we can avoid: generating a large and rich specific 360VR video dataset, carrying out numerous subjective quality assessments, and performing the corresponding training and testing stage. The validation of VMAF on 360VR contents has been carried out in two steps. Initially, VMAF was applied to omnidirectional sequences encoded with constant QP in the whole range of possible values to obtain the variation of the score with the encoding parameter. Later, VMAF scores were validate through a subjective assessment together with an adjustment of the VMAF-vs-QP curve with a finite number of key operating points. After an exhaustive study on the feasibility of VMAF on 360VR contents, the results prove that VMAF works sufficiently correctly with omnidirectional contents, without performing any particular adjustments. Therefore, the creation of a 360VR dataset can be avoided, thus saving computing and time resources. This activity of GTI is supported by the Spanish Projects IVME (Immersive Visual Media Environments) and AAVP (Advanced Adaptive Video Personalization).